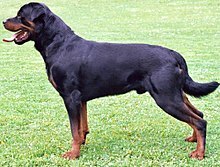 The Rottweiler is a breed o domestic dug, regairdit as medium-tae-lairge or lairge. The dogs war kent in German as Rottweiler Metzgerhund, meanin Rottweil butchers' dugs, acause ane o thair uises wis tae herd fermstockin an pull cairts laden wi butchered meat tae mercat. This continued till the mid-19t century whan railweys replaced droving for herdin. Rottweilers are nou uised as rake an rescue dugs, as guide dugs for the blind, as guard dugs an polis dugs. ↑ 1.0 1.1 "Rottweiler breed standard" (PDF). FCI. Retrieved 28 February 2016.